Also known as Bisca, Sueca is one of the most famous trick-takingcard games in Brazil and Portugal. A trick-taking card game is onein which players take turns playing cards and the highest cardplayed each round wins the trick. Shuffle the cards, cut the deck,discover the trump card, have fun trumping your opponent out andscoring lots of points with your partner. What are you waiting forto download the best Sueca game? Play on your mobile phone whereveryou like with Sueca Jogatina! * Choose where to cut the deck, justlike in a real game of Sueca! * Select whether the card that setsthe trump will be pulled from the top or bottom of the deck. * Setwhether the game starts with the person who cuts the deck. *Clockwise or anti-clockwise: determine the player order. *Whitewash: with all the cards or all the points? Does it win thegame, or is it worth 4 points? Choose! If you like Hearts, Spadesand other trick-taking card games, you'll love Sueca. The suitsdon't matter; the trump is all yours: download Sueca Jogatina nowand have a great time with this incredible card game! Have fun with this great classic: Dominos! Create private matchesand play dominos with your friends, try to defeat your opponentswith strategy, reasoning and a little bit of luck. Dominos Game:Dominoes Online and Free Board Games is an app for dominos fans andclassic board games lovers! With it, you can have endless funwhenever and wherever you want. Check out its main features: Playwith bots, friends and others players: Play dominos online withyour Facebook friends or challenge others players from anywhere inthe world! If you want, you can train with our bots too. - 4different dominos games modes: Choose your favorite dominoes mode:Turbo Dominoes, Draw Dominoes, Dominoes All Fives and BlockDominoes. - Matches with 2 or 4 players: Choose if you will createa match with just two players or two teams. Other features theDominos Game: Dominoes Online and Free Board Games: - 3 difficultylevels; - Customize the table and the dominoes tiles; - Statisticsfrom your matches. If you like classic board games like Checkers,Mahjong, Backgammon, and Chess, you will love Dominos Game:Dominoes Online and Free Board Games. Play with your family thisamazing classic board game! Download Dominos Game: Dominoes Onlineand Free Board Games now! Jouez à la Belote Jogatina et découvrez la meilleure version du jeusur Android.Ce jeu est GRATUIT, avec TROIS versions: BeloteClassique, Belote Classique avec Annonces et BeloteCoinchée.Profitez aussi d’une interface agréable et moderne!★ ★ ★ ★★- Parties de 500, 700 ou 1000 points.- Panneau d’astucesexclusif.- 3 vitesses: Lent, Normal et Rapide.- Interface moderneet stylisée- Optimisé pour Android.- Jouez sans limites! Ici, vousjouez autant de fois que vous voulez.- Visuel personnalisable: vouschoisissez la couleur des cartes et de la table.- Sauvez vosparties contre les robots et reprenez les là où vous vous étiezarrêté.- Pas de pré-inscription.- Jouez où que vous soyez.★ ★ ★ ★★Installez gratuitement Belote maintenant sur ​​votre Android.PlayBelote Jogatina and discover the best version of the game onAndroid.This game is FREE, with THREE versions: Belote Classic,Belote Belote Classic with ads and Coinchée.Take advantage of anice interface and modern!★ ★ ★ ★ ★- 500 Parties, 700 or 1000points.- Panel exclusive tips.- 3-speed: Slow, Normal and Fast.-Modern and stylish interface- Optimized for Android.- Play withoutlimits! Here, you play as many times as you want.- CustomizableVisual: you choose the color of the cards and the table.- Save yourgames against the robots and return them to where you left off.- Nopre-registration.- Play wherever you are.★ ★ ★ ★ ★Install freeBelote now on your Android. Buraco, Canastra, Burraco. Doesn't matter howit is called, what matter is that now this famous game is availabeon Android devices.You will be able to play a lot of the game variations:International rules, Italian Buraco Federation rules, Portugueserules, or any rules variation you like. You can also create you ownvariation!Besides that, a lot of graphic options are available, such as:Background images, back cards images, animation speed, compactgames on table (ideal for small screen devices), portrait orlandscape modes.Game Characteristics:* 2 or 4 players* Clockwise or Counter-Clockwise* Three levels of difficult: Easy, Normal or Hard* Total points per game: 2005, 3000, 5000 or ilimited* Discard Pile can be opened or closed* Vulnerability option* Preset rules: International, Italian Federation, Portuguesevariations, etcRules Variations:* Allow/Disallow JOKER* Allow/Disallow Groups (same rank)* A-K or 2-A Runs can worth 500 points* Aces can be used before 2, after K or in both cases* Allow/Disallow A-A Runs* A-A Runs can worth 1000 points* Allow/Disallow Half-Clean Runs (Italian Buraco Federation)* Going Out Condition: Need a clean run, need a dirty run or noconditionThis game is a must have for all Buraco lovers! Buraco, Canastra, Burraco. Doesn't matter how it is called, whatmatter is that now this famous game is availabe on Android devices.You will be able to play a lot of the game variations:International rules, Italian Buraco Federation rules, Portugueserules, or any rules variation you like. You can also create you ownvariation!Besides that, a lot of graphic options are available, such as:Background images, back cards images, animation speed, compactgames on table (ideal for small screen devices), portrait orlandscape modes.Game Characteristics:* 2 or 4 players* Clockwise or Counter-Clockwise* Three levels of difficult: Easy, Normal or Hard* Total points per game: 2005, 3000, 5000 or ilimited* Discard Pile can be opened or closed* Vulnerability option* Preset rules: International, Italian Federation, Portuguesevariations, etcRules Variations:* Allow/Disallow JOKER* Allow/Disallow Groups (same rank)* A-K or 2-A Runs can worth 500 points* Aces can be used before 2, after K or in both cases* Allow/Disallow A-A Runs* A-A Runs can worth 1000 points* Allow/Disallow Half-Clean Runs (Italian Buraco Federation)* Going Out Condition: Need a clean run, need a dirty run or noconditionThis game is a must have for all Buraco lovers! Mahjong Shanghai Jogatina - Solitaire Board Game is the top choiceamong fans of this age old game. It is the perfect companion forthose who only have a few minutes to spend or hours.The simplerules and engaging game play has made Mahjong Solitaire become oneof the most popular casual games in the world. Whether you want torelax or do some brain and visual training this is the right choiceof Mahjong for you. And more: this is a FREE Mahjonggame!Features:* 900 puzzles and growing on every new edition*Specially designed for Android* Beautiful backgrounds to choosefrom* Unique tile sets! * Relaxing game play* Hints, highlights andundo options* Optimized for Retina Devices! * Complete challenginggoals and get up to three stars per solved board! * Three difficultylevels: Easy, Medium and Hard* And more!Playing Mahjong Solitaireis as easy as it seems! Find and match pairs of identical tiles.When you get all tiles matched you complete the board.The game isalso called Mahjongg Trails, Chinese Mahjong, Majong, Mah-jong,Kyodai, Majiang, Mah jongg and is the worldwide top playedclassical mahjong.Have much fun and as a side benefit you willdevelop your spacial reasoning, logical resources, visual memoryand thinking agility. Enjoy this millennial oriental pastime. How is it? The Sueca is a variant of the game Bisca in Portugueseand Briscola in Italian. Play is Sueca with a deck of 40 cardswhere the first team to win four rounds wins the game. At thebeginning of the round you get 10 cards and dispute 120 points.Each hand is won by the highest card played and double that do morethan 60 points wins the round. What do points? The ranks of thecards, in order from highest to lowest, is: 2, 3, 4, 5, 6, Q, J, K,7, Ace All of these has a corresponding value ranging from 0 to 11.The total value of all cards sum is 120 points. Download now andhave fun with: • Sueca online to play with people or robots •Played in 4 people (two doubles) • Excellent game graphics and easygameplay • Lounges for all types of players IF YOU ARE COMPETITIVE:• Play Tournaments • Dispute positions in the ranking • Check yourgame stats. BUT IF YOU JUST PLAY FOR FUN: • Play casually Online •Train and have fun with our robots. • Chat with players during thegame or individually with your friends! • Use search filters tofind players • Meet people and make friends! Sueca mobile is a cardgame app for amateurs and professionals card players! Download nowand enjoy! 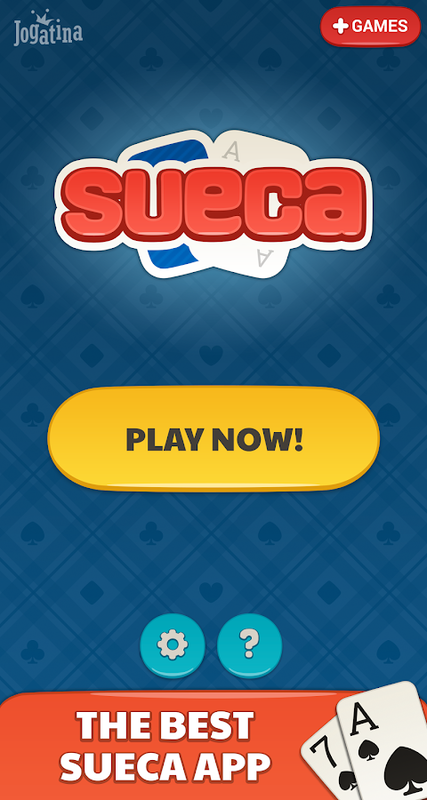 The classic sueca game, on your cellphone.Sueca is a card gameplayed by 4 players.You can play solo or online with your friends. Hearts card game featuring: - Really challenging computers - Onlinemultiplayer - Statistics - Jack of diamonds settings - Passingrules settings - Change names and avatars - Change a color style ofthe game - Choose between several decks - Landscape and portraitsupport - Fits phones, tablets and HD phones It’s time to breaksome hearts! And beware of computers – they don’t cheat, but theyare evil and unforgiving! Improve your hearts playing skills by playing our top-ranked freeHearts cards game with Leaderboards and Achievements. With all theStatistics and Smart AI opponents, you will enjoy joker card gameoffline. Download and play hearts card game to become best playerof card game. Accept the new hearts multiplayer card gametournament challenge and become a Hearts pro by winning all thematches in the hearts championship. A Hearts cards classic 2019 hasdifferent difficulty settings so that you can play by adjustingaccording to your hearts playing skills up to playing like a pro.All statistics will available for wins and losses and moon shots sothat you could see your performance and analyze how much you areimproving yourself over time in hearts plus game. You can chooseeasy, standard or pro according to your hearts playing skills. Allcards are distributed randomly to all players in this newmultiplayer cards game, the difference between the easy, standard,and pro you will feel in computer players that how they choose toplay the cards with you. You can also click on the hint button tosee how to play hearts plus card game offline. New hearts cardsfree brings to you to play hearts online 2019 with classic cardsand popular 4 players to connect with them online. You can starthearts championship just by connecting with 4 online cards playersin this online classic hearts game. New Hearts cards 2019 freeprovides high class graphics with super smooth gameplay. You willfind highly scalable difficulty and much more in this hearts onlinecards game. Play hearts online as multiplayer cards game and alsoplay hearts offline with system designed AI in different difficultylevels. New classic hearts 2019 is premier hearts cards gameavailable now for smart android phones and tablets. Just follow thecard game rules designed in this game. - Statistics visibility to analyze cardsplaying performance - Passing performance rules settings - Easy,standard and pro levels to play - Landscape and portrait HD viewsupport - Different characters to choose and play against them -Different background options - Jack of Diamonds Variant, ( a ruleof Hearts ) - Available for Tablet and Phone Download heartsoffline from google play and enjoy its new updated premiumfeatures. Have an online fun with friends, break hearts afterwinning the cards championship. Don’t be smart, don’t cheat incards championship game, you would never been successful in playingcards with friends by cheating in real. Give your valuable feedbackafter playing this hearts plus multiplayer game after playing it.Your comments will help us in improving game quality, graphics andmuch more. Good luck gamers.